The Accelerator Pedal Sensor is the direct Human Input devise for driving the engine, but on work vehicles, they can be easily damaged from foot well carpet dust or water. 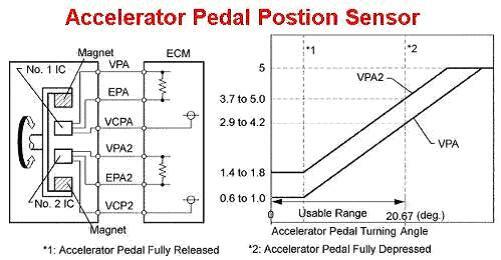 As you depress the pedal the signal voltage should steadily rise from 0-5v. Depressing the accel pedal & this Sensor results in rising Fuel Pressure in the Fuel Rail to make the engine rpm increase. On faulty sensors we see the voltage jump up by up to 0.5v at points instead of a steady smooth progression. This can result in engine surging at these jump points. Some people fit these as well as using a Tuning Box for the fuel system. But if you need to fit both then your Fuel Tuning Box is not set right, it obviously has too much delay before the Tuning Map starts. We also have these boxes in our range but only ever use them on vehicles where there is no other alternate method of Tuning. They only improve pedal response, there is no top end power gain & fuel economy can be worse than standard. Also beware when buying these; a cheap product may result in “Uncontrolled Acceleration” as Pedal boxes do send a higher voltage signal than was intended by the manufacturer. If the system fails the drivers only option is to turn off the ignition while driving removing power assistance to steering & brakes.